Hero Histories: The Coming of the Courageous Captain! A plethora of patriotic super-heroes POW! THWOCK! and BIFF!ed their way into the pages of Golden Age comic books, usually clad in red, white, and blue garb. A number of them were either assisted by an embodiment of an element of "American Spirit" (like Fighting Yank) or were themselves the actual embodiment of a "Spirit of Freedom", like Uncle Sam! Captain Courageous was one of the latter. He had no secret identity, and tended to appear when brave Americans were in perilous situations requiring almost divine intervention, disappearing after the threat was disposed of. His powers were never clearly defined, and seemed almost limitless, including flight, super-strength and limited invulnerabilty, although he could be captured or knocked-out as the plot required. 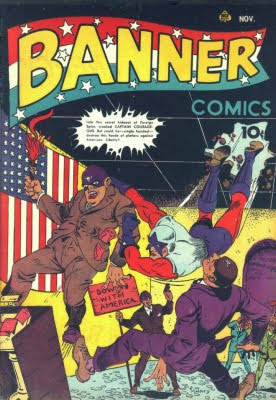 The Captain debuted in Banner Comics #3 and took over the title as of #6. Instead he moved into the anthology Four Favorites from #5 up to #29, when the comic dropped superheroes in favor of humor tales. As you might have guessed, Alex Ross has included him in the assortment of characters revived in the new Project SuperPowers universe, this time as part of the "Super-MysteryMen" team made up of other characters from his original publisher, Ace Comics! We at Atomic Kommie Comics™ have revived Captain Courageous, as part of our Lost Heroes of the Golden Age of Comics™ line, with two covers (including the single issue of his own title) on t-shirts, messenger bags, mugs and other kool kollectibles! Remember, Captain America ain't the only star-spangled captain in comics! Black Terror, Death Defying 'Devil, Masquerade, and Project SuperPowers "Volume 2", as well as Savage Dragon! ON SALE NOW!